2020 Columbine (Colo.) offensive lineman Andrew Gentry‍ took his first official visit this weekend and once again left Notre Dame impressed. 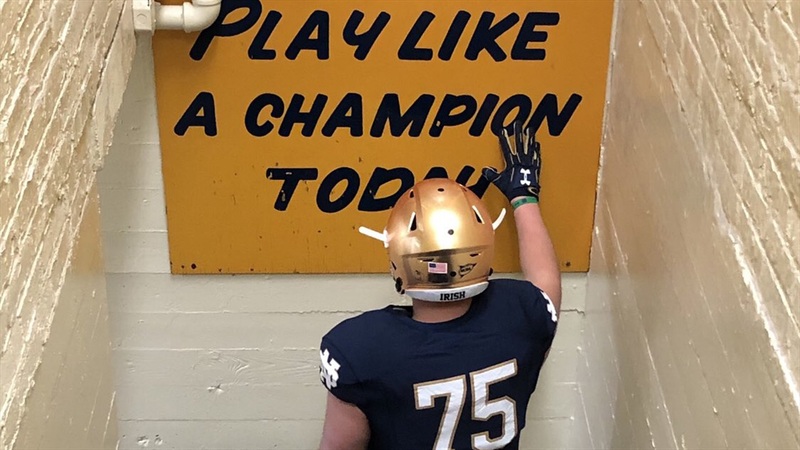 The four-star prospect spent time with offensive line coach Jeff Quinn and Notre Dame football coach Brian Kelly, who had similar messages. 48 hours on campus also provided Gentry a chance to mix it up with Notre Dame’s current offensive line. Gentry was able to get to know them and see how close the entire group is to each other. Gentry wasn’t the only top prospect on campus as Notre Dame hosted eight official visitors along with several signees and commits. It provided a chance for Gentry to get know the other prospects and get a feel of who he could be playing with in the future. As Gentry heads back to Colorado, he’ll start planning out the rest of his visit schedule and the Irish sit in a good position. “I’m still trying to finalize a couple of official visits,” said Gentry. I’ll try and commit this summer.